I want to start my first blog of the year by wishing a Happy New Year to all of our centres, students, assessors and supporters. At the end of every year we give our centres the opportunity to tell us what they believe we’re doing right and how they think we can improve by completing our Customer Service Survey. We rely on feedback from our centres to make sure we’re supporting our centres in the ways that they need, as best as we can. In the final weeks of 2017, I was delighted to see that our customer support was rated at an average of 93 out of a possible 100. We were also pleased that 88% of Signature centres are likely to recommend us; an increase from 2016 and proof that our commitment to customer support is continuing to work well. This feedback from our centres shapes and influences the decisions we make. In 2018, we are investing in online assessments and transfer of assessments to make the processes faster and simpler for centres, developing new resources for learners, and providing more training for teachers. We will be hosting a ‘best practice and skills forum’ – an opportunity for teachers to share skills, knowledge and best practice of Signature qualifications – more information coming very soon. For me personally, 2018 marks 10 years at Signature and two as executive director. Since I joined Signature in 2008, I’m proud to say we’ve become a much more modern, effective organisation with the same unwavering commitment to achieving our goals. In those 10 years we’ve made a huge commitment to technology which has made things easier for centres and changed processes so candidates can get their results faster. Our focus on innovation has allowed us to spread BSL skills and deaf awareness even further – to primary school children with SignSpell, and to high street retailers with Get Deaf Aware. We created the Signature Learning Hub so that teachers and students can improve their skills from wherever they are, and we’re actively responding to queries via social media. This year, we’re hosting the 10th anniversary of the Signature Annual Awards; ten years of celebrating the people who are making a real, positive difference. We’ve achieved a lot in 10 years, but we couldn’t have done it without you. 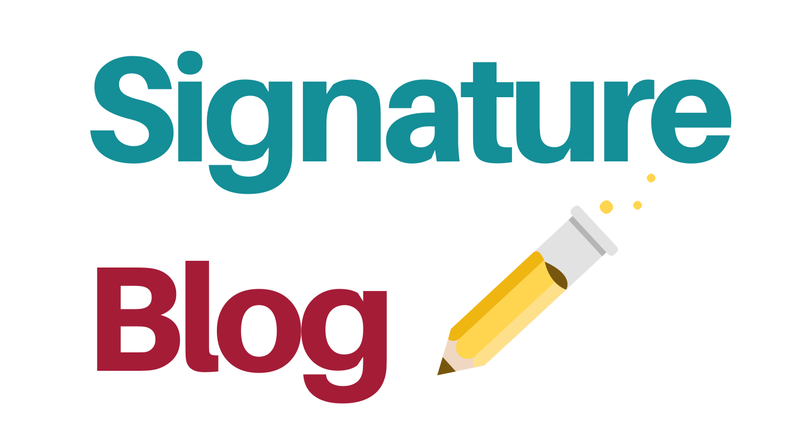 With your support, Signature will remain fully committed to our goals and continue to inspire and support thousands of people across the country.